Watch for your favorite book or if you have one you would like to see reviewed, let us know. F & W Publications Inc.
Csilla's projects start with easy pieces then moves on to more challenging ones. I found her style to be innovative and unique because she uses more than just beads with the soutache cord. She used tila beads as accents and ball chain which I have not seen used with soutache before. The braided leather in the Apollo Pendant is the perfect touch. Several of her necklaces have soutache elements at the clasp. Her hand embroidered clasp is beautiful. The open rings add an airiness to her pieces and the rhinestone chain adds glitz and glamor. The Mexico pendant has twisted bugles for a very nice effect and the tassel on the bottom is attention getting. The India choker has box chain stitched in it as an accent. I found her color combinations delightful. There are 3 earring designs, 6 necklaces, 3 bracelets, 2 rings, and 1 brooch for a good variety of projects to choose from. The pictures are very detailed and plentiful. The Baroque Bracelet and Angeline Necklace were my favorites. The Angeline necklace shows how to successfully combine many elements. There is a short resource page at the back for finding materials and an author biography. I am pleased that I purchased this book. If you are interested in making soutache jewelry, I believe that you will find this book helpful. I have admired Isabella Lam's beaded designs in the beading magazines and other bead books for a long time so I was excited to hear that she was publishing a book of her work. Her designs are classic, sophisticated, and sparkly. There are 25 projects in this book, 9 are necklaces, 8 are bracelets, 5 are pendants, and 3 are earring designs. The book is named appropriately as the designs are indeed beautiful. As is typical with beading book the start is basics about bead shapes, tools, and techniques. Isabella uses a bezeled rivoli in most of these designs. She does use a great variety of beads in her designs including seed beads, duos, O beads, tiles, drops, pearls, bicone and other crystals, bibo beads, two-hole triangles, rulla, rose montee, daggers, rizo, kheops, pips, trinity beads, ½ tilas, and tulip petals. So whatever kind of beads you like she probably has a design using them. She includes more than one color variation for several of her designs which show how different colors affect the look of the design. The Fan, Stardust, and Sunshine patterns are shown in bracelet, earring and necklace sets. One of my favorite designs from this book is the Trivoli pendant. It uses 7 rivolis in three different sizes. I have purchased the materials to make this design. I am sure I will also make several other designs from this beautiful book. The illustrations are very clear and easy to follow thanks to Melissa Grakowsky Shippee. The pictures capture these gorgeous designs in wonderful detail. There are interesting quotes about jewelry throughout the book. There is also a small 4-piece gallery at the end showing other designs and 3 paragraphs about the author. Overall, I am delighted that I purchased this book. One thing that I did note is that she did not state the finished size for the bracelets which would affect the number of beads needed. This book is one of the most creative beading books I have ever read. Karen is truly a one of a kind artist with beads. She includes work by 20 other artists. This is Karen's second book. The following quote is from her first book but I feel it sums things up better than I can. ” At its essence, Creativity is a willingness to pay attention and ask questions, and the courage to experiment with the answers.” Karen shows this to perfection in this book. Chapter 1: Getting Started shows basic stitches both in drawings and in pictures. In the thread section Karen uses two seven color samples with twelve different colors of thread to show the difference thread color makes. It is one of the most thorough examples I have seen. She also shows a very secure thread ending path without using knots. She says that knots come undone and create blockages, which make later stitching more difficult. The first paragraph in the Freeform Peyote Techniques section explain her ideas beautifully “Freeform Peyote is Abstract, not Random, Organic, rather than strictly geometric. Think of the way tree roots grow into the soil, or cream swirls into coffee; one sinuous shape melding into the next. Those are some of my personal guideposts in freeform design.” Karen shows the difference between working along the length and along the width of a bracelet. Her diagrams with pictures is a really effective way of showing the idea. Next comes building bridges and minimizing lumps and bumps. Following that comes working around curves and building a flat spiral. Then Karen goes on to explain using the elements of design. She shares a great page that helped me to understand better the difference between value and contrast. Next is physical texture, then visual texture, and line. Her color wheel section is very comprehensive. She uses dishes of beads to explain temperature as well as undertones and intensity. Then she shows monochromatic, analogous, complimentary, and triadic creations. The last page of this chapter is expanding on a theme. Chapter 2: Little Beauties starts with freeform earrings, followed by flame leaves. Karen's Lotus Blossom Hair Ornament is one of my favorite pieces from this book. She shows in detail the design process that she used to create it. Rings and things is next. Karen's beaded beads and personal planets are wonderful. They make me want to try freeform even though my brain tends to prefer symmetrical. Karen is generous with her diagrams and pictures which help explain her process. Her owl brooch is adorable. She even shows earrings that are wirework with freeform beading. Chapter 3: Working with Ruffles. Sample #1 is as fast as you can go. Sample #2 is looser, larger ruffles. Sample #3 is shaping the ruffle. Then she shows a comparison of the three samples that really lets you see the differences. Spiral Dancer earrings follow. The way she shows both the diagram and the photo makes seeing the process so much better. The next section is Stone Brooches. Another design that grabbed my attention was Poppy Hat Brooch. Karen shows an inspiration picture, materials pictures, layout decision pictures, a worktable picture, process pictures, and the completed brooch on her hat. In Coral Dancer Bracelet, she shows how designs sometimes morph into something else. This design started out as a necklace and became a bracelet. Throughout the book, Karen shows the back of the pieces which most people do not. This really helped me to understand how it was created and its structure. Her tip in this section is try your design on as you work because things look different when worn than they do lying flat. Chapter 4: Designing Larger Jewelry Projects - Karen breaks the stages down into stitching the base structure, decorating the surface, and attaching the clasp, button, or finding. She states that bracelets are the most popular item made with freeform, however this section shows necklaces. Cynthia Machata, who is a featured artist created the necklace named Surf. It is truly stunning. It is very open and lacy much like the waves in a surf would be. She shows three different design ideas before coming up with the final design. Rattlesnake choker can be worn two ways which make it versatile. Karen explains that freeform pieces go through an ugly duckling stage and sometimes end up as UFO's. Rattlesnake choker was one of these only to be picked up later and finished beautifully. Several places in this book Karen shows her sketches and then compares her designs to the sketches as she works. She ends this chapter with a gallery of four pieces, one of which is a First Holy Communion Veil. Chapter 5: Beyond Jewelry - Karen's sense of whimsy is reflected in her Fountain of Youth Beaded Bottle. She explains it as Ponce de Leon meets Coca Cola. The eight-inch bottle is fully beaded and then covered with vines and flowers. In Message in a Bottle she starts by creating sea creatures including barnacles, anemones, and nudibranchs, then attaches them to the bottle. Her inspiration for this piece was imagining a group of castaways putting messages into a bottle. Karen included messages in her bottle. The first bottle by Cortney Phillips has a suede bottom and she glues bead embroidered cabochons to the sides of the bottle as anchor points. Then she beads between them creating a beautiful piece. Nancy Dale is a featured artist who gives a tutorial on beading rocks in the freeform style to create scenes. The next featured artist is Georgia McMillan who does adorable fish. Georgia has dyslexia which makes following patterns difficult so she developed her own method and created these wonderful creatures. Then Karen shows one of her fish. I found it really interesting that she drew tails on tracing paper on tried them on this fish like we did with paper dolls as children. How imaginative is that? The end of the book includes biographies for the featured artists. When I started reading this borrowed book I simply wanted to know more about freeform beading. I like things to be symmetrical and I did not think I wanted to do freeform beading but after reading this amazing book I am definitely going to give it a serious try. Karen encourages the reader to experiment. She has inspired me and I think that she will inspire you too. Beadweaving Beyond the Basics is a project based book which contains 24 projects. There are 9 necklaces, 11 bracelets, and 5 earrings. The book is divided into 3 chapters pl​us the beginning and a gallery at the end. Each chapter features a different right angle weave variation technique. I have admired Kassie's designs when they appeared in Beadwork magazine so I was drawn to this book. Right angle weave is the technique most used in the projects. I admit that it is not my favorite stitch, however Kassie adapts the stitch in ways that make it faster and easier. She suggests that if you are having trouble learning the stitch try it with bugle beads instead of seed beads. Several of the designs are reversible giving you two pieces from one design. I found it very interesting that Kassie showed a lot of designs that lead to another design. I will be making several designs from this book because I found them unique and interesting. She encourages the reader to use her designs as a starting point to creating their own designs. She even asks the reader to contact her with what you have made and to ask for help if you get stuck on something. The beginning is an introduction and a short section on the beads that she uses most often. Following that is a review of favorite stitches including herringbone, right angle weave, peyote, and St. Petersburg chain. Chapter 1: Double Diamond Right Angle Weave. Kassie starts the chapter with a primer on how to do the stitch and suggests experimenting with other types of beads than just seed beads including bugles and bicones. She even includes tips for lefties. In fact there are tips with every project in the book. Starflower is my favorite design in this section. Chapter 2: Faux Right Angle Weave. Kassie starts again with a primer to get the reader going using this stitch. The Firewheel Daisy pendant in this chapter is shown on a St.Petersburg chain which accents the pendant perfectly. The next design is Firewheel Spinner which expands on the first idea. The Wheelies earrings are dainty and would work up quickly. Yo-yo Reversible pendant features a pair of lunasoft cabs for an interesting 2-sided design. Chapter 3: Layered Right Angle Weave looks similar to Cubic Right Angle Weave but it would be much easier to stitch. The Reversible Braided Bracelet is a simple idea but it is really lovely. It is one of the designs that I will make. I also like the Crystal Twist Bracelet. It is stitched flat then the last round makes it twist. The Faux Ribbon Pendant looks like soutache made with seed beads which intrigued me. The final project is Cupola which is shown on the cover. This design uses the layered right angle weave technique to bezel a rivoli in a domed design. The gallery shows 10 of Kassie's designs including her 2013 entry in the International Battle of the Beadsmiths. Kassie is also an Artbeads Design Partner and a 2016-2017 Starman Trendsetter. She has had numerous designs published in Beadwork magazine and has done several videos for Interweave. She conducted a webinar for Interweave about Drawing Graphics in Microsoft Word in which I learned a great deal about creating images for bead patterns. She is a Beadwork 2017 Designer of the Year. The intermediate designs shown in this book come from someone who is very much a part of the beading community. I recommend this book if you want something fun and different to stitch. ​I bought this book back in September of 2011. You are probably thinking what a great memory I have. Well, not really. When I buy a book I put the purchase date on the inside cover so that I know how long it takes me to actually use the book. Back in 2011, I know I left the book in the bathroom where I do so much of my reading, especially books with pictures. It lingered there for quite a while and yes, the photos are great. I finally got around to reading the book and wow! That really changed my overall impression. I originally thought it was rather simplistic, but then I read on. At first glance it looked like right angle weave with 2 or 3 beads for each side. I have done lots of right angle weave, but then as I thought about making a project in the book, and really read the instructions, there was a 2 drop bump, a 4 drop bump, a 3/3/3/4 drop bump. Huh? What is a drop bump? And there is that reading stuff again. This time I had to look back to the beginning of the book, where there is the 'How To' section, which I had skipped over thinking that I know 'How To' most anything. I thought what a clever lady - these bumps are how you can fill in the right angle weaves. There are so many different ways – like how high do you want the bump? Should the right angle weave have even sides? One example is a pair of earrings with a right angle weave that has 3/4/5/4 beads on the sides, which then opens the door to a shape other than square. The book is filled with necklaces, earrings and bracelets - quite a variety and quite a variety of what can go into a bump. I have already started a pair of earrings and I am loving them. The book is easy to follow. My favorite stitch has been cubic right angle weave as a rope, and now I am thinking that like life, there could be bumps along the way. ​Innovative and unique are the first two words that come to mind with the premise of this book. Kat Wisniewski has developed a new twist on doing chain mail. I spoke with Kat at the Bead & Button Show and she said that she was looking for a way to set herself apart. She has certainly done that. I see her ideas as revolutionizing how we all see chain mail. I will admit that chain mail is not the first technique that I turn to but, the idea of using rubber and glass rings intrigued me so I bought the book. I was rewarded with a totally delightful way of doing chain mail. The rubber and glass rings add a different dimension to this ancient art form. They are fun to work with and add lots of color to the designs. They add a texture and dimension that is not possible when using just the typical metal rings. The beginning of the book has a section on how to work with the rings, make substitutions, and even a paragraph for those who are left handed. There is a chart comparing Standard wire gauge and American wire gauge to help you when purchasing the rings. Next is a tool section followed by a short techniques section which shows how to open and close the rings properly, time saving tips, cleaning and tumbling. The projects start with the easiest and work up to the more difficult. There are 25 innovative designs. Kat shows earrings, bracelets, necklaces, and pendants. The pictures are plentiful and easy to follow. Tips are provided throughout. She even tells the time length to expect for each project. Supply lists are provided and kits are available for all of these designs. Other design options and other color ideas are provided for most of the designs. I have made a pair of earrings and I have supplies ordered to make several other projects from this book. I am very glad that I purchased this book. It is everything that I anticipated and more. The techniques presented will add a new dimension to my jewelry designs. If you are looking for something fun and new to try, I highly recommend this book. I have been a fan of Cynthia's work since I started beading so I was excited to hear she had published a book on her techniques. “Modern Beaded Lace” does not disappoint. The first line of the introduction explains it: “Beaded lace is a hybrid of lacemaking and bead weaving, and both have been a part of my life for as long as I can remember.” Cynthia is well versed in both lacemaking and bead weaving having done both for many decades. She says she started creating beaded lace when she could no longer see well enough to make thread lace. After the typical start, which shows types of beads, findings, stringing materials, and tools, Cynthia goes into the different types of lace: needle lace, crochet and tatting, bobbin lace, hardinger lace, lace edging, insertion lace, and ruffles. Projects in the book are designed from each of these types. Next she describes the elements of lace which are cordonnets (cords that define the edges), figures, and ground. Following that is a page on designing beaded lace. Then she goes on to show the stitches used in the book. She uses many stitches to achieve the looks that she wants including fringe, ladder, reinforced flat herringbone, reinforced tubular herringbone, triangular tubular herringbone, netting, peyote, right-angle weave, modified right-angle weave, Russian snake, square, and modified square. Eighteen projects are given in Part two of the book. Many of the designs use pearls and small crystals. They start at the beginner level and increase in difficulty as the book progresses. Some are lacy and open while others are quite dense with multiple layers. Each project lists the techniques used, materials, tools, finished size and skill level. Projects include six bracelets, six earrings, four necklaces, one ring and one pendant. I would be proud to wear any of the designs in this delightful book. Cynthia encourages the reader to experiment and learn to make your own beaded lace designs for example, The Cirque earrings on page 53 begin with “Round figures are very popular in lace, and these sparkly rounds can be used in many different ways in your own designs. The dangle demonstrates one possible way to attach these circles to cordonnets or figures; they would also be lovely against a more solid ground in a collar or bracelet.” Cynthia supplies lots of tips along the way to aid the reader in design. Beth has written two other books, but not since 2009, so she has had several years to develop new techniques. And develop them she has. She starts out with seed beads and then quickly moves to adding other shapes and sizes. Her writing is clear and concise with plenty of photos and diagrams. And like Blanche DuBois, I do rely on the kindness of diagrams. Beth teaches you how to do something and then shows how it can be used as part of a project. Sometimes combining is the hardest part of beading. I have already used a large flower as a fringe for a pendant and will continue to add her stitches and shapes to other projects. This book is a great addition to any bead library. This is the first book by one of the foremost people in the field, Cynthia Rutledge. She has been published in many books and magazines, but this is her first solo publication. She has taught nationally and internationally for many years so she is well prepared for this endeavor. Her designs, using lots of pearls and cubic zirconias, are contemporary but timeless -- classic and elegant. Cynthia claims history as her muse and it is evident in the designs. The painting that inspired each design is shown and a brief description of the painting, including information about the painter, is included. I found this a wonderful addition to learning her designs. The designs in this book are meant for intermediate-to-advanced-level beaders. There are 15 all new designs including necklaces, earrings, bracelets, a ring and a brooch. All designs have more than one version and the supply lists for all versions are included. In addition, the skill level for each project is listed. The plentiful illustrations in this book are clear and easy to follow, and the photographs are coffee-table worthy. The first section of the book is titled getting started. It includes a supply kit list and basic stitches. Something that I learned from this section of the book was a bookbinder’s knot which is used for adding new thread. I have always wondered why peyote stitch patterns start with stringing a certain number of beads followed by stringing another bead. Cynthia just starts with stringing all of the needed beads then skipping the last two beads and stitching into the third bead. This description makes so much more sense to me. A technique Cynthia uses that is unique to her is her odd count peyote turn around. She calls it step-up/step-down peyote stitch. This is something I am going to try on my next odd count peyote project. Cynthia launches the projects with the Renaissance Cameo Necklace. The next project is Earrings for the Dutch Mona Lisa. The key to Unlocking the Past is next, followed by Florentine Rosette Cuff. Hebe's Floral Earrings, Time in Motion Ring, Labyrinth Bracelet, Amalie's Pearl Necklace, Victorian Garland Necklace, The Queen's Lace Bracelet, A Token of Love and Affection, Byzantine Pearl Cuff, Necklace of Dancing Circles, Pearl Inlay Earrings, and An Elegant Ladies' Brooch complete the list. Many of the designs have a channel that she fills with pearls or fire polished beads. I would have a very hard time picking a favorite from these designs. All are beautifully constructed and finished. Cynthia attaches many of the components with a loop on each part and two beaded jump rings between them. She uses two beaded buttons and a double beaded loop as a clasp on many of her projects. This allows the necklace to be opened easily by both left handed and right handed people. It also helps the necklace to hang evenly and stay centered on the wearer. I think that this seems like a wonderful way to end a necklace and have not seen this unique design used by others. I am very glad I purchased this book and would love to take a class from Cynthia. If you like making gorgeous, elegant jewelry, you will enjoy this book. Thomasin Alyxander is the author of this exciting new book published by Kalambach Books. The title describes the contents very well. Alex, as she calls herself, shows how to stitch 26 different elements and then how to combine them into beautiful jewelry pieces. In the introduction she states: “My hope is that this book will let your inner designer out to play.” I find this an exciting way to think of learning. When I read this book my fingers were itching to start stitching. Alex was a Starman Trendsetting designer in 2013. This is evident in the fact that several of the elements use the Starman new two-hole beads. Many of the elements are beaded on both sides so they make wonderful earrings that can be seen from both sides as they swing from our earlobes. She gives variations to show how to make the elements as pendants or links. The elements stitch up quickly so it is easy to make several in a very short time. Her instructions and illustrations are very clear, and easy to understand and follow. The second section of the book has eight earring designs using the elements. There are ten bracelet designs. Two of them show one and two strand variations for variety. Five necklace designs completes this section. The necklaces and several of the bracelets combine more than one of the elements. Many of them show multiple colorways to let you see the difference color can make in your design. There is a five page gallery section for even more inspiration. Following that is a basics section which includes information on beads, thread, tools, set up, wrapped loops, crimping, using epoxy clay, and more. ​Alex is right in saying that there are endless possibilities for ways to combine the elements, or as I would call them components, into beautiful jewelry designs. I highly recommend this book. We have a copy in our library for our members to check out. This is a project based book about working with the new two-hole shaped beads. Virginia Jensen starts by identifying the different types of two-hole beads and then moves on to the basics of working with them with basic stitches. The author uses a wonderful variety of two-hole beads in her designs including squares, bricks, super-duos, cubes, rullas, bars, tilas, discs, daggers, and studs. Each chapter focuses on one stitch. Jensen starts with the simplest stitch, stringing, in Chapter 1. She then moves on to peyote stitch in Chapter 2. Chapter 3 covers the braid stitch, which was developed specifically for two-hole beads. There are designs in both S braid and double braid. Chapter 4 looks at step stitch, which was derived from St. Petersburg chain. Herringbone is the stitch used in Chapter 5. In traditional herringbone the beads sit at a slant, but the nature of the two-hole beads makes them sit straight in this stitch. I like the herringbone bracelet with super-duos – it would make a great necklace strap! Crossweave stitch is explored in Chapter 6. This stitch works up quickly. There is a two-hole dagger necklace pattern in this section that includes a variation with one-hole dagger beads because they are easier to find. The pattern does use two-hole squares and super-duos. Right angle weave with two-hole beads has both vertical and horizontal orientation on the beads. It is the focus of Chapter 7. I made a design from this chapter and really enjoyed it. The large stud and squares bracelet includes two needle alternative directions. Chapter 8 is cluster stitch developed by the author. It is a variation of right angle weave. I found this stitch interesting to work with. There is a gallery at the end of this chapter that includes seven pieces to show a few of the possibilities this stitch holds. ​The only downfall that I found in this book is in that when some of the designs call for two bead colors, the colors are not labeled “Color A” and “Color B” as is done normally. The instructions say to add two beads without specifying one Color A bead and one Color B bead, so you need to look at the illustration to determine which colors to add. Despite this drawback, I found the book very informative and interesting. I am sure I will make several more of the designs from this book. ​Denise Peck and Jane Dickerson. This is a nice book on handcrafting your own findings. After all, it is always hard to decide what type of clasp would beperfect with your current project. With this book you can create what you want without going shopping. It is a book geared towards beginning wire workers that takes you through increasingly more complex projects. It covers basic wire work, texturizing, silver fusing, adding patina and traditional finishes. Projects include several types of clasps, ear wires, beads and links and connectors with a few extra fun things thrown in. The basic technique section is a good resource for questions about what size or type of wire to use and the gallery section in the back has great inspiration! The 30 projects are well documented with step-by-step photographs and instructions. If you ever wanted to work with metals but did not want to use a torch, this is the book for you. Fifteen of your favorite metal artists have contributed projects to this book, all of which use cold-connection techniques. The author first takes you through the tools, all of which are readily available and affordable for almost any budget, detailing what they are used for, how they are used and what you can do with them. Then she outlines the techniques themselves with very clear and understandable photos. Once you have reviewed the basics you will have no trouble starting any of the projects. You will learn how to use rivets, screws and other materials to combine elements like found objects, metal shapes and frames - all without having to deal with the heat or other complications that a torch can bring. Accompanying each project are tips from designers for additional ideas and ways to customize the design. This book is for anyone looking to release their creativity without lighting a flame. have a problem with the rest of the book. edging or a lariat necklace. 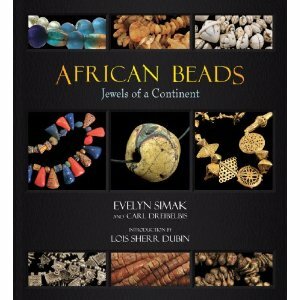 This book's a jewel African Beads: Jewels of a Continent is a real treasure. While a number of books explore the history and beauty of beads traded in Africa, most focus on beads made in Europe and carried to Africa by traders. This book instead devotes its attention exclusively to beads made in Africa, from the earliest shell beads to today's metal and recycled glass beauties. Written by two long-time and highly respected bead enthusiasts and collectors, and published by a company committed to buying and selling an outstanding selection of African-made and African-traded European beads and African artifacts, the book is organized by material -- bone and shell, wood and amber, stone, metal, and glass. Each section contains historical information, methods of construction, and cultural information where known. A major highlight of the book is the hundreds of outstanding close-up photos of the beads. In most cases, a photo features one type of bead, bigger than life and definitely lust-inducing. In some instances, I would have found it useful to see the beads in context -- what other beads were/are they usually used with? How are they worn? Happily, unlike in some otherwise excellent bead study books, the photo captions are specific and informative. This book covers a huge number of beads and necessarily can't tell as much as we would like to know about every one. But without a doubt, the book is the definitive tone on African-made beads -- so far. I enthusiastically recommend it. they are filled with watercolors, shapes and drawings. Anyone who thinks they might like to try mixed media jewelry can’t help but be inspired by this book. It starts with a techniques section and then moves on to step by step directions and illustrations for 20 designs. Also included are insights into Cynthia’s design process for giving each project its own magic. Just as its name implies this book really is an Encyclopedia that covers just about any technique used to make jewelry except seed bead weaving. If you were ever thinking about branching out from stringing or bead weaving, this is the book for you. For metal and wire it talks about cutting, piercing, filing, annealing, soldering, polishing, links, wrapping, riveting and shaping. For plastic and rubber you learn about basic properties of the material plus overlay and inlay, laminating, heat forming, screen printing, dying and cutting. From there you move on to fabric, fibers and leather and the various ways to manipulate them. Paper and paper pulp come next with paper making and casting. The book finishes with a few other materials and general casting and decorating effects. The first chapter is a helpful introduction offering guidance on essential tools and inspirational advice for self-designed projects. Each chapter includes and introduction to the properties and possibilities of each material and an examination of the possible techniques that can be used. This is a great book to spark your creative energies and let you know what is involved in using each of the mentioned items. Do you have that great piece of chain in your stash that you could not pass up on your last trip to the bead store, but don’t know quite what to do with it? This book will give you great ideas and get your creative juices flowing. The introductory chapter starts with photos and an explanation of the types of chain generally available, the tools usedto work with chain and basic wire wrapping techniques to connect the chain pieces and attach beads and findings. It continues with 50 projects made out of a combination of different types of chain, findings and beads. You can make the projects as shown or combine the techniques shown into your own creations. Jane Dickerson is the managing editor of Step By Step Beads and contributing editor to Step by Step Wire Jewelry. The title of this book tells you that you will be working with copper. But do not stop there as the techniques will work with silver or other wire as well or be bold and combine the different types of wire. The techniques are all very well documented and photographed and cover coils, cold joins, wire wrapping, ear wires, charms, polishing and apply patina and much, much more. This is a great book for basic techniques and how to combine those basic wire principles so that they do NOT look basic at all. There are 17 projects, by some of the top jewelry designers and wirework artists in the field, to get your creative juices flowing. Along with money saving tips for using your stash and other "finds" in your jewelry designs. If you are into wirework this is a good book to add to your library. Jayne Emerson has branched out from her previous book, Simply Felt, to needle felting in this new book. She has a marvelous eye for color and form and walks you through the process of needle felting both by hand and machine to produce textiles to wear or decorate your home. She does not just use wool to do her felting, but incorporates fabric and yarn into her creations. Unlike regular felting with wool, needle felting is done without water using a barbed needle and several other tools and it is no where near as messy as wet felting. The book begins with an introduction to the tools, materials and basic methods. You could get a sewing machine that is set up with multiple needles to do your felting, but you can also do the work by hand with just a single needle and a base to felt on. There are 20 projects in the book including fiber jewelry, coasters, pillow covers, scarves, sweaters, blankets, bags and more. You will not believe what can be decorated using hand felting techniques and how easy it is. This is a good reference book for anyone wanting to try needle felting or anyone who has tried it but wants to branch out from just using wool. This book, from the editor of Step by Step Wire Jewelry, is a collection of fifty designs from top wire artists highlighting the versatility of wire. It starts out really great by giving you information on wire styles and shapes and how to measure them using a wire gauge. It goes on telling about all the different tools used in working with wire and what their uses are. It covers pliers, hammering and finishing tools along with techniques for using all of the tools. Different styles of loops, coils and spirals, jump rings, hooks, and ear wires are all detailed with large, clear photos. All of this is on the first 25 pages and is actually the best part of the book. ​Crochet Jewelry: 40 Beautiful and Unique Designs by Waejong Kim and Anna Pulvermakher. If you like to crochet and you like to wear jewelry this is the book for you! It starts out by going over the basic stitches and stitch and shaping techniques and continues with tools and equipment needed as well and findings and notions you can use to finish the projects. Even if you did not know how to crochet before you started reading this book, you will when you are finished and have some great jewelry to wear as a bonus. Necklaces, bracelets, rings, earrings, pins, eyeglass holders and more are covered in the book using yarn, thread and wire. The best part is that you do not have to be an expert to make this jewelry. Crochet has enjoyed a resurgence in recent years along with knitting and other needle arts, but is not just for fiber artists anymore. Whether beaders want jewelry using wire or to incorporate fiber into their work they will find designs that result in attractive jewelry. There are even a few designs that incorporate felting, another hot fiber trend that is crossing over into beading designs. October 2007, Carol Huber Cypher has brought together felting projects from 20 fiber artists for this book. A long time fiber artist herself, Carol has also included information about each artist and their inspiration for each project. Projects include hats, vessels, necklaces, boots, bags, dresses, scarves and much more along with a list of sources and artist contacts. One of the unusual, fun techniques described in the book is felting over a ball or balloon to create hats or vessels. While there is a section on basic felting techniques, I would not recommend this book for beginning felters. It is, however, great for inspiration for anyone with at least a little felting experience and will get your creative juices running with the gorgeous photos of the projects and the gallery section that features less utilitarian pieces to inspire and delight.